On 9th May 2016 Mercury will appear to pass in front of the Sun, bringing the smallest planet in the Solar System into focus. We will be observing the event at the National Museum, Cardiff form midday on 9th May – come and join us! To prepare for this rare event, we are organising an evening of talks on 21st April. 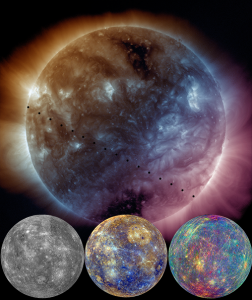 Come and listen to special invited speakers talking about the two contrasting worlds: Mercury and the Sun. With NASA’s Messenger mission recently coming to a dramatic end at Mercury, and with ESA’s BepiColombo mission due for launch in early 2017, we are learning a great deal about this enigmatic planet. Dr Suzanne Imber, who studies Mercury at the University of Leicester, will tell us about the latest results from our Solar System’s innermost planet. The tiny sphere of Mercury is in stark contrast to the violent and constantly changing ball of plasma that is the Sun. A wide range of missions are continuing to tell us a great deal about the Sun and its effects on the Earth. Prof Chris Scott, a solar physicist at the University of Reading, will tell us about our closest star. A poster advertising the event is available here. Anyone wishing to book groups of tickets should contact us at events@astro.cf.ac.uk. These events are run in conjunction with National Museum Wales and the Institute of Physics (Wales).